A World War II heroine is brought to life in this humane, fast-moving historical novel. 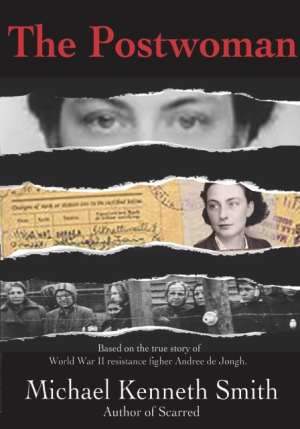 Michael Kenneth Smith’s riveting World War II novel The Postwoman is based on the life of Andrée De Jongh, who worked to help downed Allied flyers. It’s a fascinating and heroic account, with elements of a captivating exposé. Young Belgian Andrée—whose nickname, Dédée, means “little mother”—is adamantly opposed to the German threat. Spurred by a resolute determination and physical strength belied by her petite frame, Dédée convinces her father that they must play a role in resisting the German forces. Networking with a chain of friends and other resistance fighters, they create the “Comet Line,” which runs through Belgium, France, and Spain, sheltering and transporting resisters and downed airmen. Dédée anchors the final leg of the journey, leading groups of Allied airmen through the Pyrenees mountains to provide safe passage back to England. She is eventually sponsored by the British. Her motivations are shown to transcend financial gain; she repeatedly risks her life for the cause of freedom. The Postwoman is truly Dédée’s story, but it is supported by an assorted cast of friends and adversaries. They include loyal Michael Cresswell, consul at the British Embassy in Spain, who supports Dédée with money and, more importantly, faith; persistent Lieutenant Colonel Kurt Lischka, whose duty to the SS drives him to find the leader of the Comet Line; and British gunner Jack, who penetrates Dédée’s stoicism and armor to become her emotional lifeline. These supporting characters are effectively drawn, with key details that give a sense of their personalities. Dialogue is fast and believable. Though driven by action, glimpses into Dédée’s personal life add a human touch, rounding her out beyond her stony will. Her emotional trials add depth to her unwavering characterization, and make it all the more easy to get caught up in her captivating journey. Many obstacles and close calls threaten the survival of the Comet Line and coolheaded Dédée, from suspicious German soldiers to the hovering specter of death and the slow-ticking clock near the war’s end. Though she helps hundreds of men to evade capture, Dédée’s final and most important success is enduring her own capture, and the ordeal of her time in a concentration camp. Efficiently written, the plot builds methodically, quickening as the years pass and the war’s end approaches. Intrigue, tension, and fear ground the story, along with a pervading hope that righteousness will prevail. The war’s atrocities are acknowledged unflinchingly. The Postwoman is a satisfying and inspiring World War II account of heroism against enormous odds.